Roles are a bit like groups, and are a key part of how you control who can do what in an application. Things like who can create a new record, take a workflow action or see a view, are controlled by roles. You add people into a role, and then tell App Builder which role can see or do something. Allows you to create a new role in the app. Allows you to add a user to the app and select a single initial roles for them. 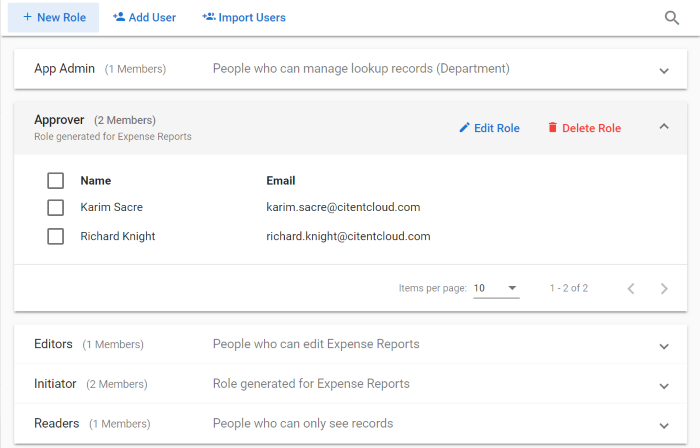 Allows you to import multiple users and assign them to a role in one step. A CSV file containing the required users email addresses must be avaiable. The fiel may contain other columns as the dialog will aloow selection of the correct column. Allows you to edit the name and description of a role. Click to delete the associated role. Enter the name for the new role, along with an optional description if desired. Name The name for the new role. Make it short but descriptive, such as Editors, Sales Managers or Approvers. Description If desired, add a longer description of the roles membership or purpose. Managed A Managed role is like a normal email group: Somebody will add and remove members of the role manually (using this screen). 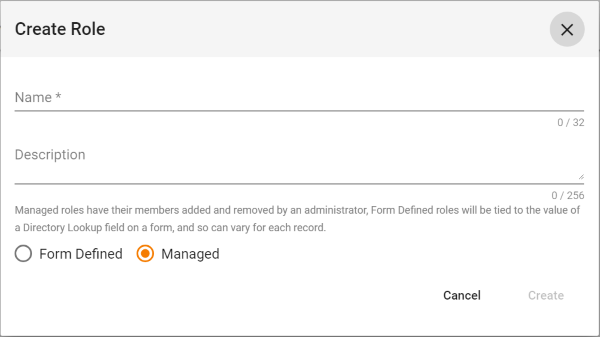 Form Defined A Form Defined role has no fixed members. Instead its members will will be looked up from the value of a specified Directory Lookup field on a form. This way the role can have different members for each record. For example, it could be the department manager of the record’s originator (assuming that information was available in the application). Enter Email Enter the user’s email address. Once enough of the address has been typed in to identify the user, their full email address will display just below the Enter Email field. Select the name. Role Select the initial role the user should be added to. The user can be assigned additional roles after they are added to the app. Email Message By default, the selected user will receive an email message alerting them that they have been added to the users for this application. If you would like to add a specific message to this email, add the text to the Email Message field. Skip sending an email to users If you don’t want like the selected user to receive an email message, then check the ‘Skip sending an email to users’ option. Attach File Click on this button to select the desired CSV file. Only files with a “.csv” fiel extension will be shown in the selection dialog. Skip first row in csv If the CSV file has a top row header with text labels to identify the contents of the columns, select this option so the header label is not imported. Role Select the initial role the user(s) should be added to. The user(s) can be assigned additional roles after they are added to the app.